Campaign Finance Watchdog Group Claims Steve Bannon Got Illegal Payments From Pro-Trump PAC - Joe.My.God. 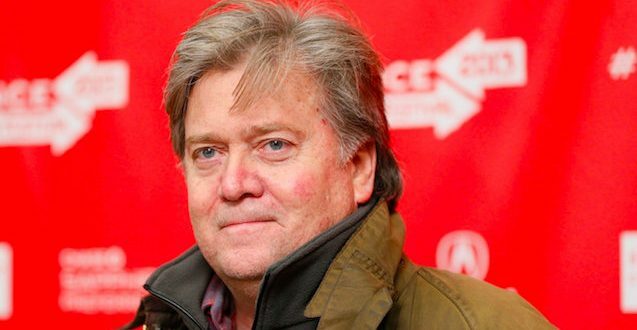 A campaign finance watchdog said today that chief White House strategist Steve Bannon may have illegally benefited from spending by a pro-Trump super PAC while he led Trump’s presidential campaign. While Trump initially criticized his Republican opponents for their close ties to super PACs and disavowed outside groups that sought to support his bid, his team embraced outside help during his general election race against Hillary Clinton and pushed the boundaries of federal election rules as much as any other 2016 candidate—testing regulations meant to ensure that super PACs operate independently from campaigns. Bannon’s disclosure, filed March 31, confirmed his financial connection to Glittering Steel, a film production company that was involved with Bannon’s Clinton Cash documentary about the Clinton family, and Torchbearer, which starred Duck Dynasty’s Phil Robertson. Make America Number 1 paid the film production company nearly $1 million during the 2016 election cycle, with payments starting in July 2015 and continuing after Bannon became the Trump campaign’s CEO.